Vermont's $100 million budget gap has lawmakers searching for spare change wherever they can find it. But there's money right on the table: The state gives up about $1 billion in tax breaks each year through policies that don't get much scrutiny. Vermont isn’t alone on that front. Robert Zahradnik is the director of state fiscal health for the Pew Charitable Trust, and he says the majority of states don’t tend to keep close track of these tax breaks or measure their efficacy. 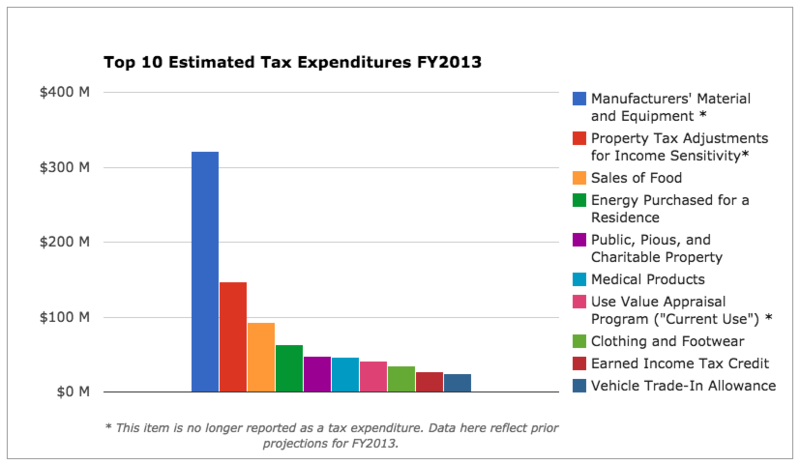 Known as “tax expenditures,” the impact of these tax breaks is the same as money spent. Think of it like an instant rebate: Instead of accepting the revenue and then handing it back out in the form of subsidies or payments, the state simply never collects certain revenues. The effect is the same. A special commission in 2011 referred to this foregone revenue as a “shadow budget” that lacks sufficient transparency. And Zahradnik says tax expenditures don’t typically get the same level of scrutiny as the annual budget. “We looked at this issue back in 2012 and released a report called Evidence Counts that found that most states really weren’t producing the kind of information that can ensure tax incentives – those tax expenditures focused on economic development … And since that time, we’ve been working with states to put in better practices,” he said. Tax expenditures come in the form of policies and programs such as tax credits, exemptions, deductions or modified tax rates. Common at both the state and federal levels, they’re designed to encourage certain activities or lower the tax burden for certain populations. Such tax breaks are available for individuals and businesses, and virtually everyone in Vermont enjoys at least a few. Common at both the state and federal levels, tax expenditures are designed to encourage certain activities or lower the tax burden for certain populations. Virtually everyone in Vermont enjoys at least a few. Vermont is one of many states, Zahradnik says, that has taken a renewed interest in tax expenditures in recent years. Think of tax expenditures like an instant rebate: Instead of accepting the revenue and then handing it back out in the form of subsidies or payments, the state simply never collects certain revenues. Vermont is ahead of some other states, he said, in that the state has defined measurable goals for all of its expenditures. But the state has not yet put significant effort into measuring progress against those goals or modifying policy to better reach them. These tax “preferences,” as they’re also sometimes called, are divided into five broad categories based on which tax revenues are foregone: sales and use, income, property, motor fuel and vehicle and banking and insurance. And unlike state spending, most of the tax breaks are permanent - unless they’re amended. They’re not voted up or down annually like the budget. But every two years, the state tallies how much money it’s not collecting. Here’s the latest glimpse of who gets to keep it. Vermont manufacturers don't have to pay taxes on their input materials or equipment. For individuals, there's no tax on most groceries, residential energy purchases or clothing. Sales and use taxes are the most visible form of taxation in the state. Virtually every time someone pays for goods or services, the state gets a small piece of that money. 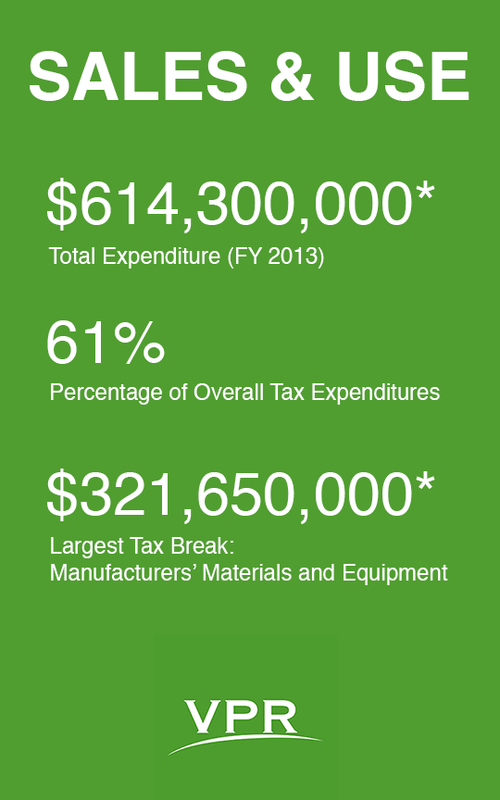 This category is also where the state gives up the most revenue in tax breaks each year, most of it (an estimated $339.1 million* in FY 2014) to manufacturers and other producers. Manufacturers, including just about any company that produces tangible goods, don’t have to pay taxes on their input materials or equipment. So if a sock manufacturer is expanding its factory, it won’t have to pay for taxes on all the new fabrics or machines it buys. Manufacturers also don’t pay taxes on the energy they use in the manufacturing process. The state does this to make it easier for manufacturers, which employ about 31,700 Vermonters, according to most recent estimates, to operate in the state by reducing overhead costs. Tax breaks for individuals make up a significant portion of the sales and use expenditures as well. There’s no tax on most groceries, residential energy purchases or clothing, and those tax breaks make up $174.7 million of FY 2014’s foregone revenue from sales and use taxes. Income sensitivity adjustments on statewide property tax bills also save Vermont taxpayers big, lately to the tune of about $145 million* a year — and that’s not counting tax breaks for public, religious and charitable organizations, or for landowners whose farm or forestland is enrolled in the state's Current Use. 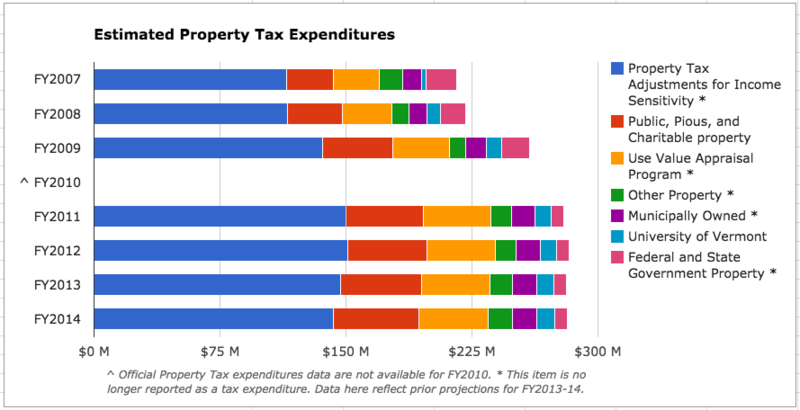 Including land such as church grounds, parcels in Current Use, and government-owned properties, property tax expenditures total about a quarter of the state’s tax breaks. Including land such as church grounds, parcels in Current Use, and government-owned properties, property tax expenditures total about a quarter of the state's tax breaks. It’s also one of the few categories of tax breaks that’s made its way into the latest round of budget discussions. In Gov. Peter Shumlin’s third inaugural address in January, he proposed revoking farmers’ Current Use status if they repeatedly fail to comply with state water quality standards. 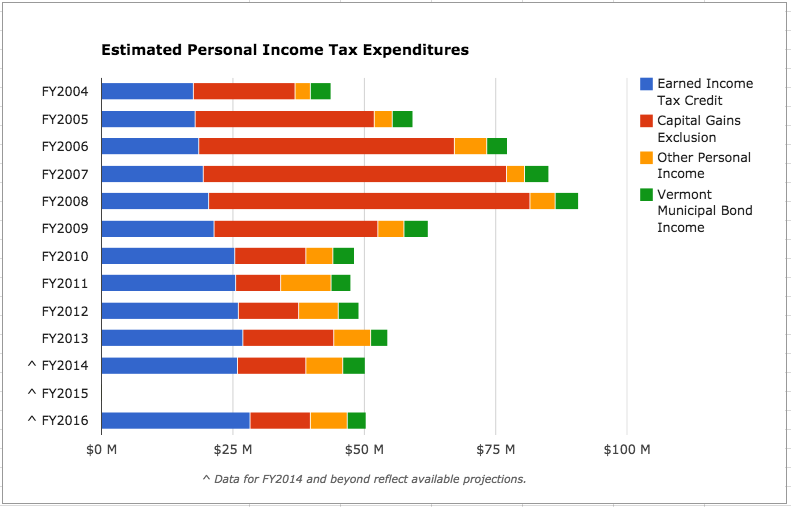 It’s people, not companies, who find the most savings from income tax expenditures. The personal exemptions and standard deductions individuals claim on their annual income tax returns add up to more than half of all income tax breaks in Vermont. Vermonters get income tax breaks for a wide range of things, from low income families’ spending on daycare ($61,000 in FY 2013) to saving for college ($1,777,000 in FY 2013). The personal exemptions and standard deductions individuals claim on their annual income tax returns add up to more than half of all income tax breaks in Vermont. Note: Income tax expenditures from one tax year are reported for the following fiscal year. Corporate tax breaks make up a much smaller portion of this category - just $5,238,000 in FY 2013, though they vary dramatically year to year (they totaled less than half a million dollars in FY 2009). Lately, most savings for corporations comes from either the Vermont Employment Growth Incentive (a cash incentive for high-paying job creation) or the Research and Development Tax Credit (designed to encourage innovation in Vermont). 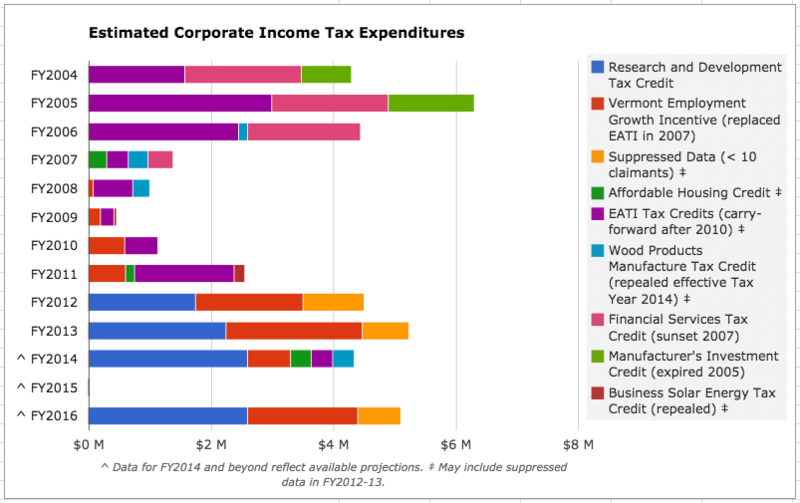 Corporate tax breaks make up a much smaller portion of this category, though they vary dramatically year to year. Note: Income tax expenditures from one tax year are reported for the following fiscal year. Most tax savings available for the banking and insurance industry go to hospital and medical service organizations in an effort to keep down the cost of health care in Vermont. And for about $10 million, some annuity considerations are exempted for insurance companies. 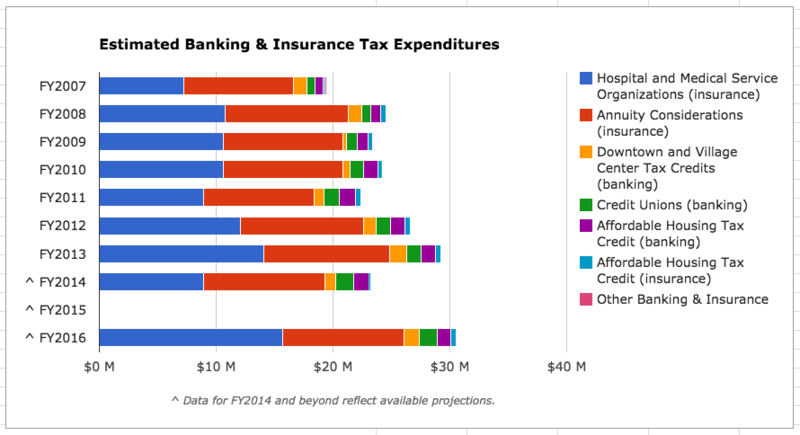 Banks pick up less than $4 million through other tax policies, including an incentive to invest in affordable housing. Most tax savings available for the banking and insurance industry go to hospital and medical service organizations in an effort to keep down the cost of health care in Vermont. While tax breaks in this category are expected to top $30 million in the coming fiscal year, overall they account for a small portion of total tax expenditures in the state. The vehicle trade-in allowance ensures vehicles are only taxed once (when they're bought) rather than twice (if they're traded in). 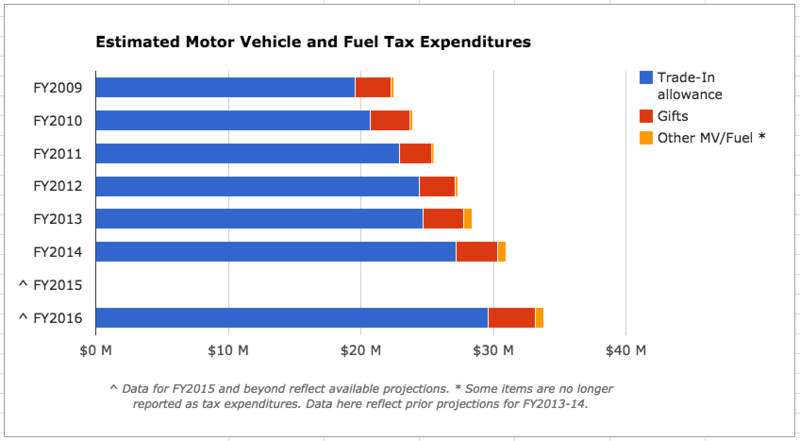 This accounts for virtually all of the tax breaks in the motor vehicle and fuel category. Other tax breaks limit the costs of certain vehicles for religious and charitable organizations, veterans and people with disabilities. The vehicle trade-in allowance ensures vehicles are only taxed once (when they're bought) rather than twice (if they're traded in). 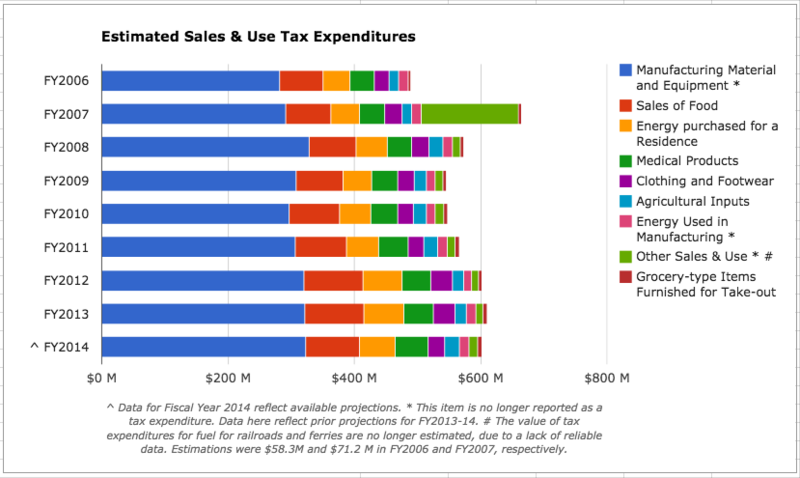 Note: Diesel tax expenditures for FY2009-12 are excluded from these calculations due to unreliability of previously reported data. There is also a tax break for diesel fuel used for farm equipment and other off-road uses. That tax break has been inaccurately reported in past years, but the accurate figure came in around $333,000 in FY 2013. Editor's note: The data presented here reflect state estimates reported by Vermont’s Joint Fiscal Office and Department of Taxes in annual or biennial tax expenditure reports since 2006. Some tax expenditures are not estimated due to unavailable data. Additionally, methodologies for estimating these values have evolved, and the details of several tax expenditures have been amended in the intervening years. As a result, the comparison over time cannot be exact, but is presented here as accurately and fairly as possible with the best available data. * Beginning with the state’s 2015 Tax Expenditures Report, certain items are no longer reported as tax expenditures. Some FY2013 values have been estimated as an average of prior projections for Fiscal Years 2012 and 2014. Hilary Niles is a data journalism consultant, multimedia investigative storyteller and award-winning researcher based in Vermont. She can be reached at h@nilesmedia.com. Some lawmakers in Montpelier are trying to call more attention to a very important, if dry, policy issue: Tax expenditures. The state of Vermont gives up around $1 billion in potential tax revenues every year. Some of the tax breaks are vitally important in the lives of hundreds or thousands of Vermonters, while others have had their value questioned in recent years. Regardless of their merits, none of these tax breaks is required to be reviewed or approved by policymakers on a regular basis.